I have a mild obsession with sheet masks. The Best Sheet Mask Series features the sheet masks that will leave your skin bright and glowing. How often have you woken up and wished your skin didn't show the evidence of the late night beforehand? Well, tired skin beware -- because the Cettua After Night Fever Soothing Sheet Mask will make your skin look AMAZING. I came across this baby at a little Korean beauty store called The Face Shop back when I went to Spa Castle. I couldn't resist a sheet mask filled with witch hazel, chamomile, punica granatum and gingko extract -- especially when the package promised plentiful nutrition and moisture. And you know what? The package was right! After only 20 minutes, my skin becomes refreshed, rejuvenated and unbelievably baby soft and smooth. I just can't believe how much better my skin looks each and every time I slip one of these over it! 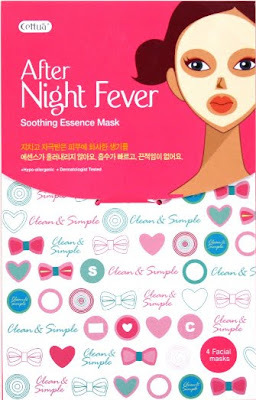 The Cettua After Night Fever Soothing Essence Mask is around $10 for a pack of 4 masks.